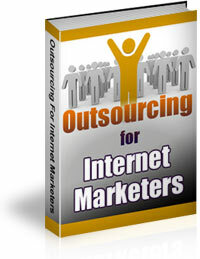 Outsourcing is one of the most important ingredients for a successful online business– especially if you want your business to give you more freedom! After all, you started an online business to make more money and to enjoy the things that are truly IMPORTANT to you, right? But you can’t spend as much time enjoying those things if you’re a slave to your business. Fortunately, the world of outsourcing is at our fingertips, and we can easily and affordably get other people to do almost EVERYTHING for us. The key is knowing how to do it. It is a brand new exclusive ebook created specially for Eric’s Tips (NOT re-hashed material). If you want to have more freedom and build your business to higher levels without working harder, please download this ebook today. It is a 47-page PDF file, and you can download it immediately. Regular Price $47 Only $9 Today! The ebook is a PDF file, readable on all computers. You also have the option of purchasing this ebook with Resale Rights, which allows you to resell the ebook from your own website for any price and keep 100% of the profits. It can also be added to paid membership sites. Regular Price $97 Only $27 Today! 100% MONEY BACK GUARANTEE! If you’re not satisfied with this product, just let us know within 60 days of your purchase and we’ll refund 100% of your purchase. After 60 days, all sales are final.